If Google seems worried, it's not just about the fact that webmasters, along with everyday Internet users, are ready to revolt and ditch Google for Bing or Marissa Mayer's Yahoo. Webmasters are on the verge of revolt against Google because the latest Penguin 2.0 update is the biggest joke since Al Gore created the Internet. Everyday Internet users are abandoning ship because Google search literally leaves them scratching their heads with the results they receive more often than they find themselves happily surfing the web to places only their imagination could have taken them 20 years ago. Can you say, "Seriously these are the results you are giving me G?" But now comes word that the Internet is set to explode with users in the next 5 to 10 years and along with that explosion, comes massive energy use needs. How To Green The Internet? Google understands the need for good PR and they know that the success of the worldwide environmental movement is dependent upon the Internet. Through industry collaboration, Google is trying to create a more sustainable technology sector and build products and services that benefit the environment. For example, they funded a research study conducted by Lawrence Berkeley National Laboratory to measure the energy impact of cloud computing. They have also hosted summits in 2009 and 2011 where they discussed with industry peers how they could improve on data center efficiency. In 2013, they hosted the “How green is the Internet?” summit to explore the environmental impacts and benefits of the Internet. In the next 5 to 10 years, according to Eric Schmidt, Executive Chairman at Google, the number of Internet users will go from today's astonishing number of 2.4 billion to a mind boggling number of 5 to 6 billion. The majority of humans will be on the Internet. How we deal with that energy expenditure, will have a lot to do with how sustainable a future we create. Is Cloud Computing The Answer To The Energy Sucking Internet? 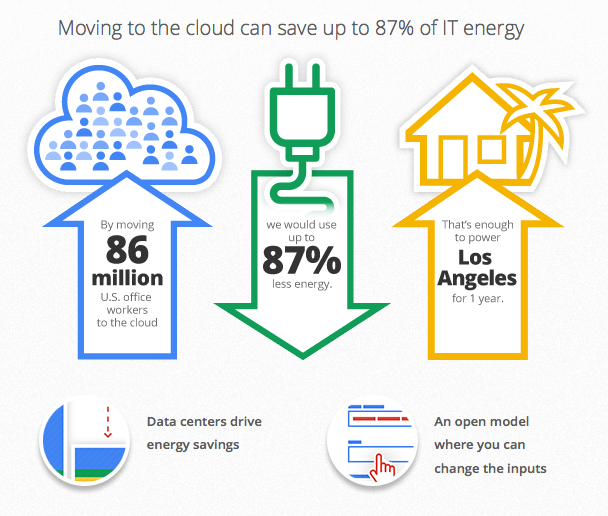 Lawrence Berkeley National Laboratory investigated the energy impact of cloud computing in a study funded by Google. Their research tells us that moving all of the office workers in the United States to the cloud, could reduce the energy used by information technology by up to 87%. These cloud computing energy savings we worker bees could create are mainly driven by increased data center efficiency when using cloud services such as email, calendars, and more. The cloud supports many products at a time, so it can more efficiently distribute resources among many users. Simply stated, this means we all want to, and can do more on the Internet with less energy through cloud computing. Led by Google, is the ethereal Internet about to save the world's energy crisis? Who knows. Only time will tell, but it seems like a huge piece to the energy crisis puzzle.